This invention makes it possible for disabled people (or anyone!) to comfortably and easily view distant wildlife or other objects of interest for extended periods of time. The stand is free-standing with a fluid 360 degree pivot range; simply remove the tethered locking pin. With the pin in place, the unit is stable and easily transported. It is designed to sit on the lap to hold the binoculars steady. It is fully adjustable to ease strain on back and shoulders. The height is adjustable by a total of 11 inches. Made of aluminum this unit weighs just 3 LBS without binoculars. 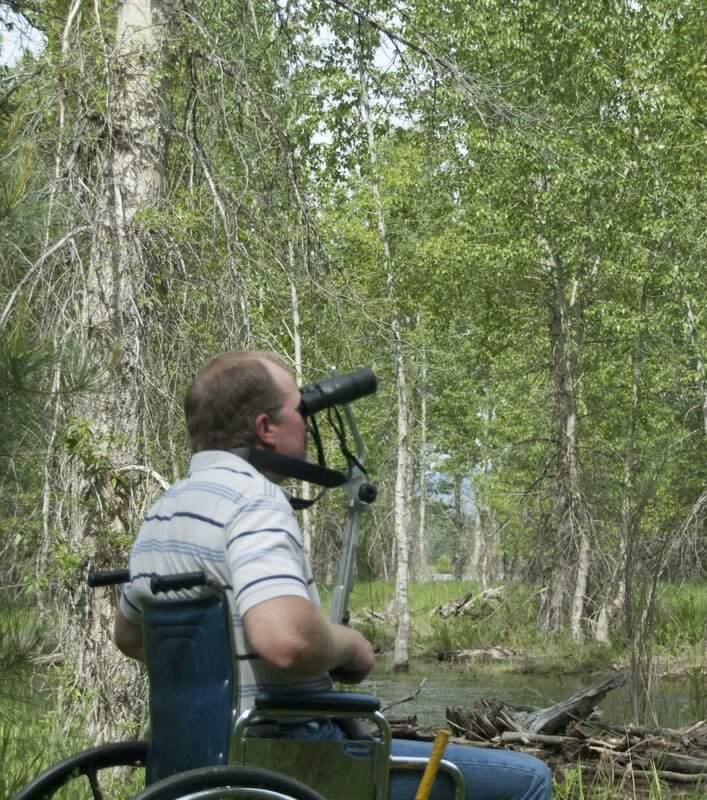 View our video to see how easy our light weight Binocular Stand is to use and adjust. Enjoy your time viewing wildlife and the great outdoors. A pair of Bushnell 10x50mm is included with our Binocular Stand. FREE Shipping in the Continental U.S. Shipping fees will apply outside the U.S. Relaxing by the river while checking out the birds. View our video to see how easy our light weight Binocular Stand is to use and adjust. Enjoy your time viewing wildlife and the great outdoors. Don't forget you can use the stand to hold your camera also. ​You can stand up or sit down to view things with a cushion on vertical tube to hold on to for steadying your binoculars. Bungee cord around waist keeps you connected to unit. 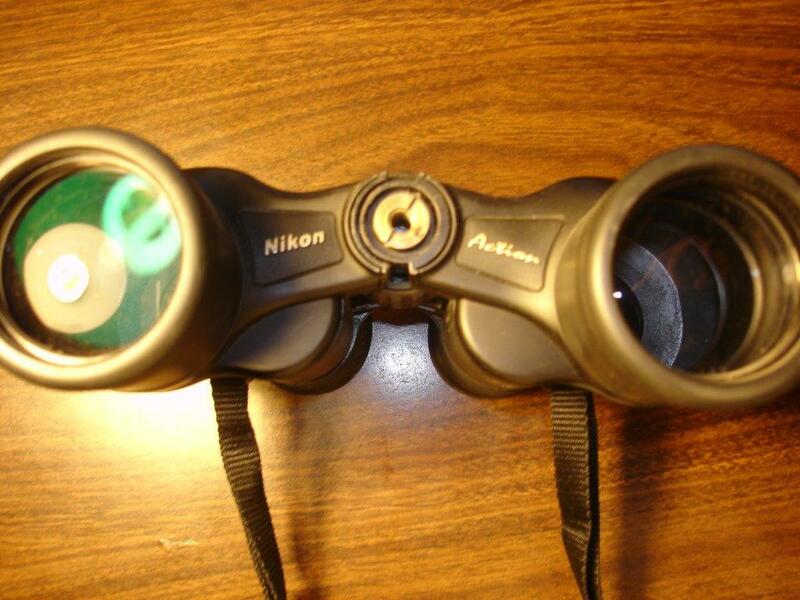 You can pivot binoculars up & down by loosening knob, it'll move 180 degrees then re tighten knob. ​Height adjustment is 7 inches by loosening screw that hold binoculars and move to different holes on vertical support bar then re tighten screw. 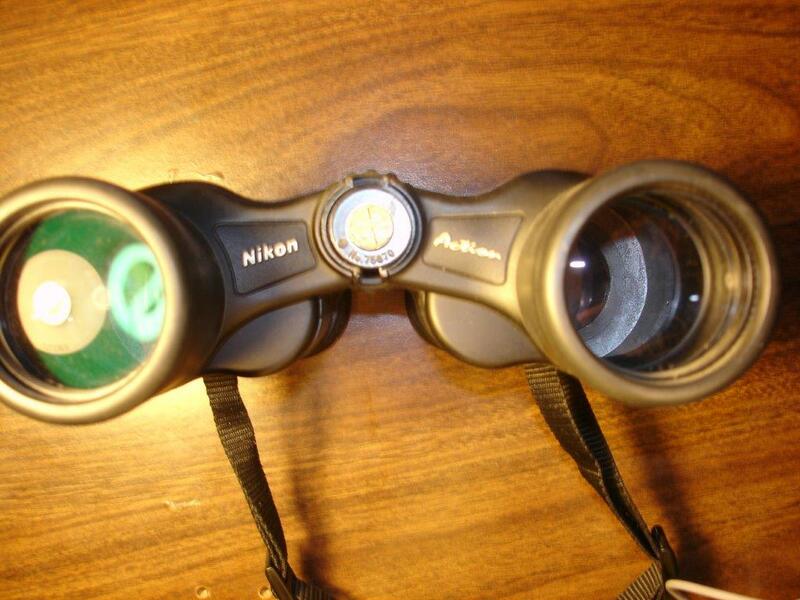 Bungee cord around waist will keep binoculars steady, you don't have to use shoulder muscles to hold it up. Watch video to see how unit looks & functions. It's made out of aluminum, including binoculars, unit weighs just 3.5lbs. New product with lower cost! In order to make this product fit perfectly for you, I'll need some measurements first. While sitting in a lawn or wheelchair, measure from top of thighs to eyes. Even though there's 11 inches of height adjustment, in case your extremely tall or short, I want to make sure it fits you properly. Most binoculars will fit our product. If you look at the front of the binoculars at the pivot point there's a cap, unscrew the cap and remove, inside there should be female threads. If they are Nikon's, they are 1/4-20 threads, if they are a different brand the threads may be different. I'll need the female thread diameter and pitch of the thread. Our binocular stands that come with binoculars are setup and are ready to attach to stand. How to measure your height. Measure from the seat to middle of shoulder so we can get you the correct height. ​Shipping fees will apply outside the U.S. 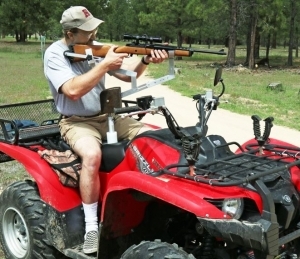 The Semi-quadriplegics Rifle Rest is the same as the paraplegic version with the addition of an attachment for the back of the rest that holds the rifle on the rest by itself. Install the attachment with the two screws that are provided. We have a longer vertical fore-end support bar for trap shooting for an extra $30. The cool thing with this product is that you can adjust the support arm to be used as a rifle rest or pistol rest. See video on how to adjust. We have a longer vertical fore-end support bar for trap shooting for an extra $30. 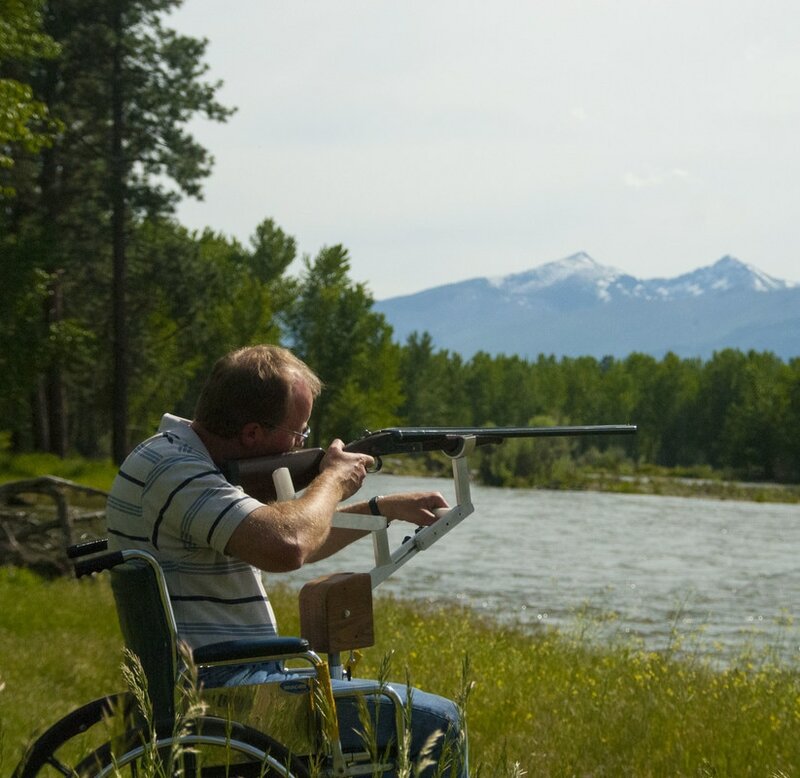 For people who want to fish from a wheelchair, this unit holds the fishing pole at an angle like you would hold it; however, it does the work so you don't have to. The wooden unit that clamps to the fishing pole handle easily pulls out of the hole in plastic boss for casting. All you have to do is re-insert fishing pole holder into plastic boss, relax and wait for a bite! To get in and out of your chair, first set the aluminum sheet on the seat of wheelchair with threaded hole at the front of the chair, like the picture. Then put the cushion on top of the sheet and sit down. Your weight will keep it stable! Screw in the plastic boss onto sheet with 3/16 Allen wrench. Now insert wooden fishing pole holder into plastic boss. Now loosen wing-nuts, lift up u-bolt with finger and insert fishing pole handle into holder to position you want and tighten wing-nuts. Now reverse procedure to get out of chair. 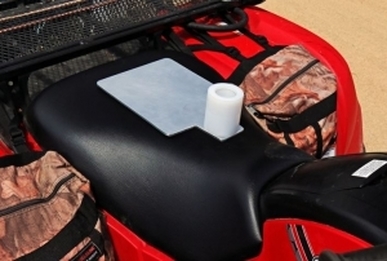 The aluminum base fits both the Rifle Rest & Fishing Pole Holder. While sitting in a lawn or wheelchair, measure from top of thighs to center line of eyes. Lots of adjustment, if you are very short or tall I want to make sure it fits you. For mounting the camera to stand, I will need the distance from base of camera to center line of eye piece.